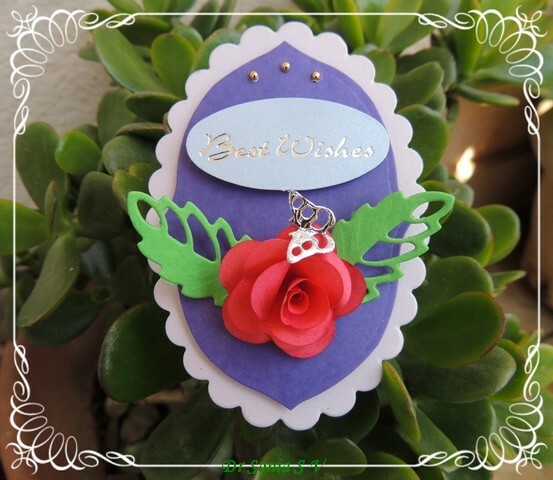 I specially designed this 3 D shaped pop up card for my dear blogger friend Tejal. 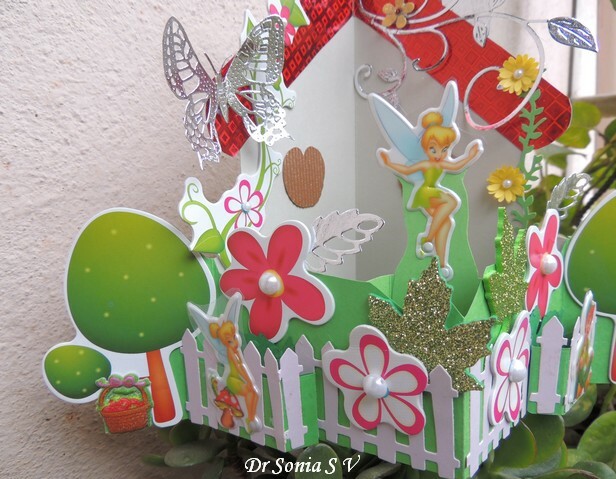 Its a scenic house shaped pop up card which stands on its own on display. 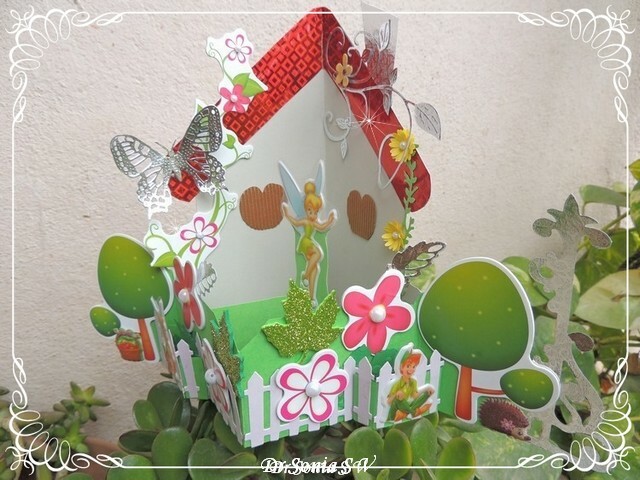 I hand cut the house shape and added little hand cut windows ,a shiny roof and a glittery chimney to make a fairy's house pop up card. 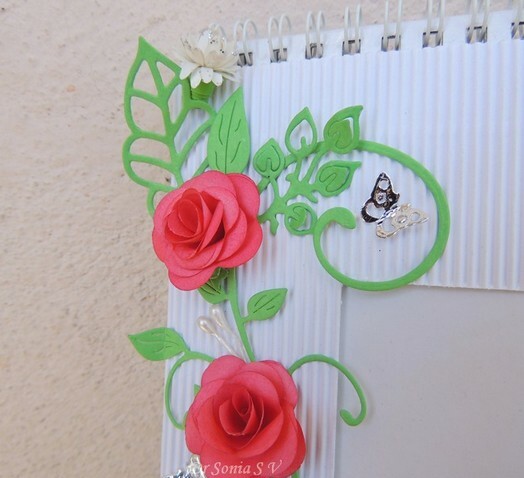 Though there are 4 layers which pop up on opening, this 3 D card can fold perfectly flat for mailing.The photo below shows the side view of the pop up card. 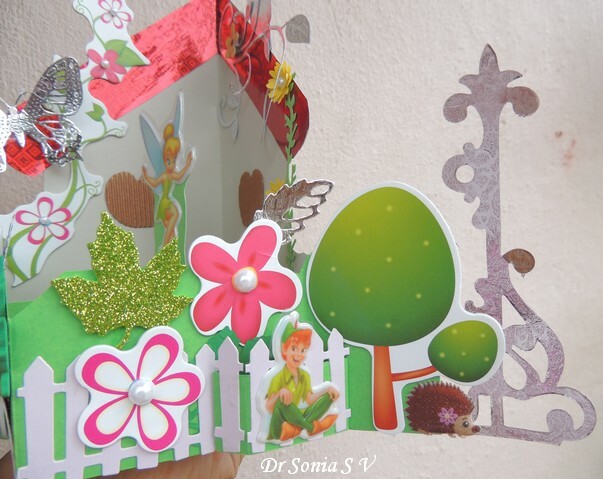 A magical elf sits on the fence which pops out from the background scene of the pop up card. 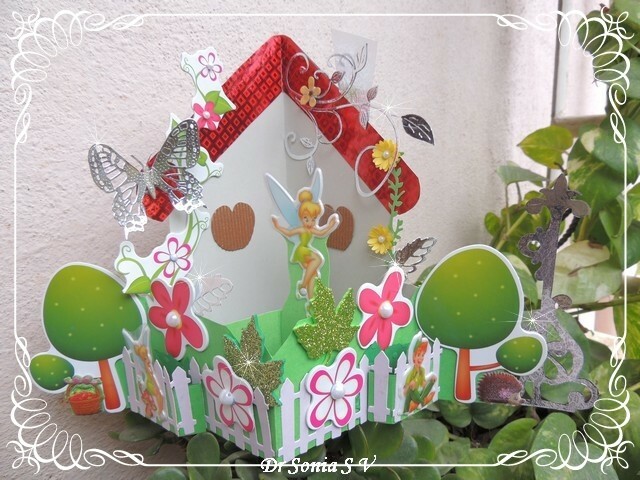 The flowers and trees are foam stickers .I placed a fairy atop a mushroom on the fence which forms a separate 3 D layer.A flying fairy pops up from behind the flowers in front of the house shaped pop up card. 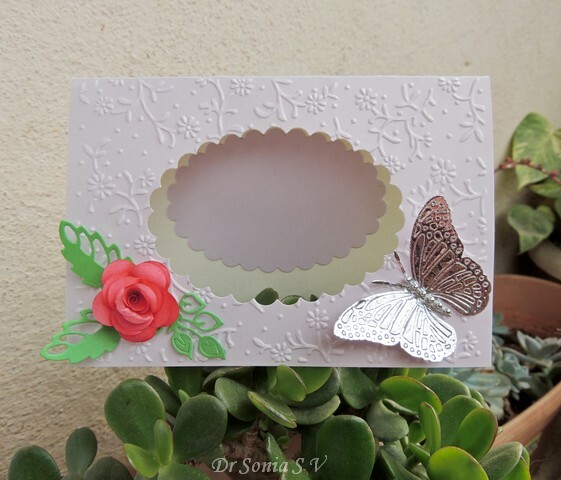 Since my friend Tejal loves butterflies I had to add a magical silver butterfly on this interactive card. 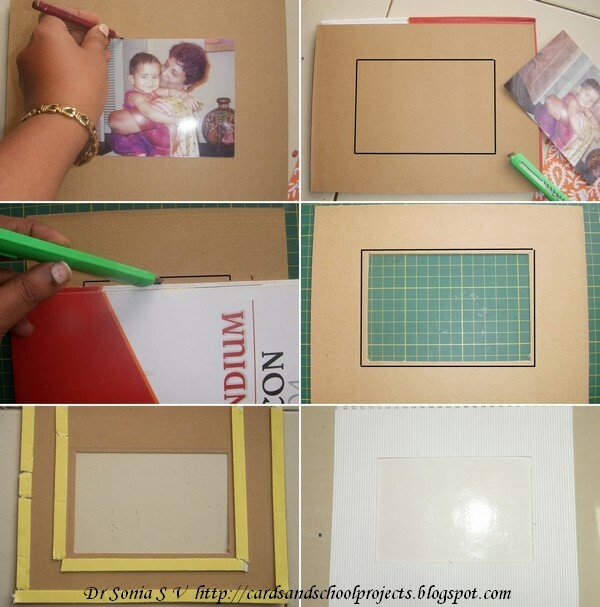 This photoframe tutorial is the simplest ever!Do refer to my earlier photoframe tutorials for more details on little steps. 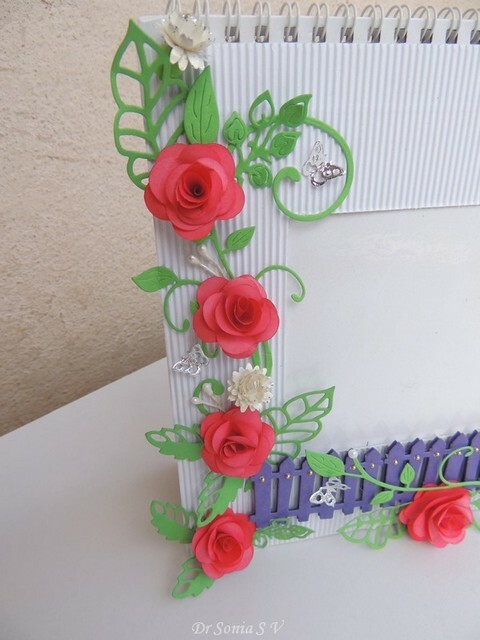 1.Corrugated paper/thick card stock/mdf etc for the front of your photo frame. I am partial to corrugated card as it is easy to cut an aperture in and still gives a sturdy frame. 5.Photo to serve as template . 1.and 2. Mark around a photo on the back side of your corrugated card--indicated by black bold line. 3. and 4.Run a craft knife against a scale or sturdy edge to cut an aperture a few millimeters inside the photo template marked. 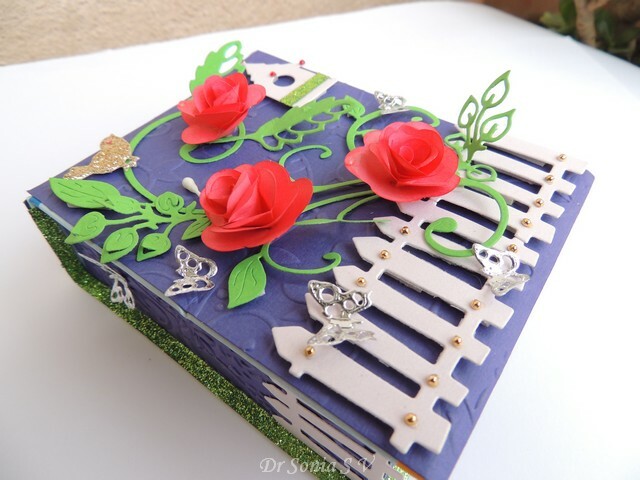 Dont worry about ragged edges-- you can always hide it with embellishments! 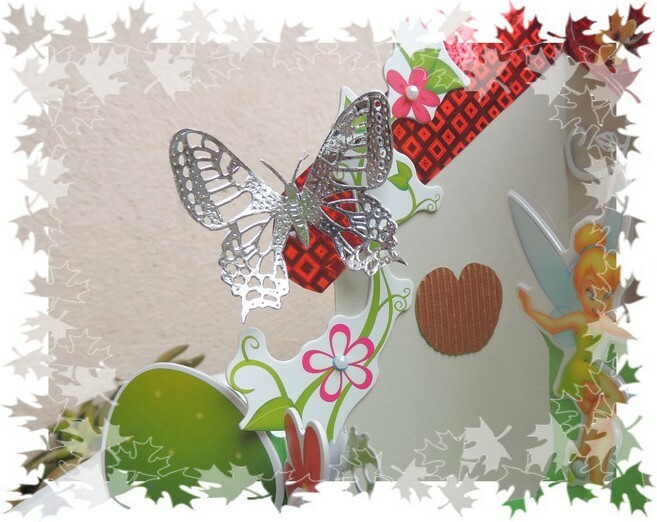 5.Stick double sided foam tape a little outside the photo template marking as shown leaving one side free so as to leave a gap to slip in your photo.Also stick double sided tape at the border edge of the corrugated card as shown. 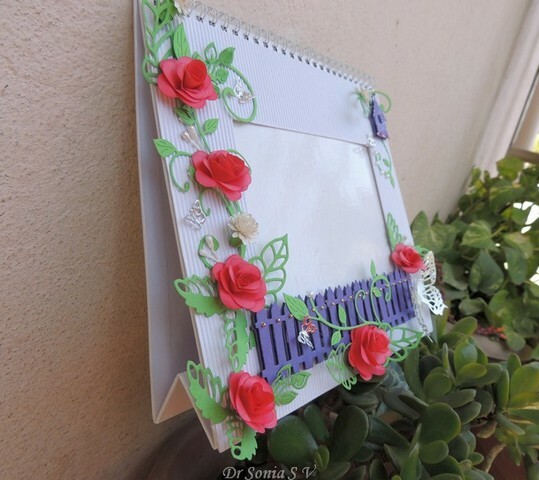 Its easier and quicker to make your photo-frame. When making photo-frames with corrugated paper avoid heavy embellishments on the side through which the photo is slipped in [ ie if you plan to keep changing your photo].The photo is slipped in from the top in this frame so all my flowers are on the sides.I layered some punched daisies and quilled a calyx to make the white punchcraft flowers. 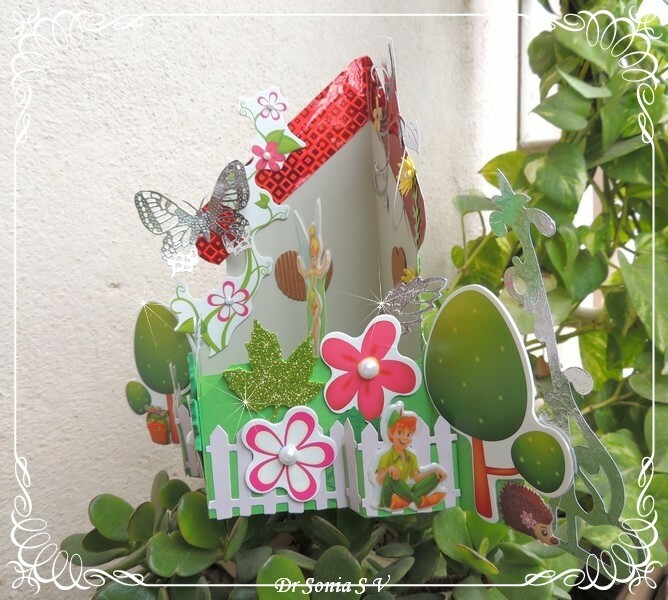 Made a 3 D bird house by layering the die cuts using double sided foam tape.The red rhinestones are bindis like I used in the altered box. 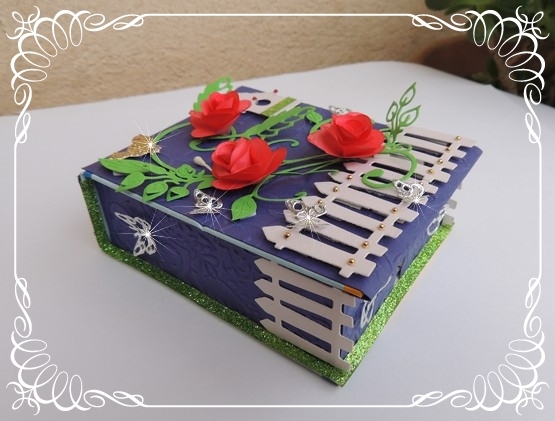 Glamorized this medicine box into a note paper holder using die cuts and punchcraft flowers. 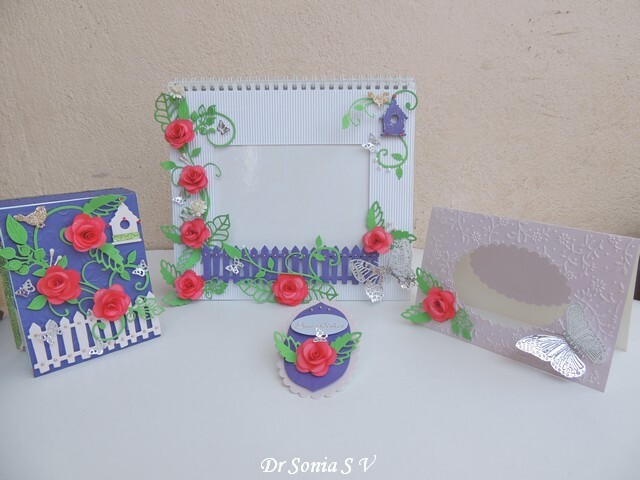 Here are all the elements of my handmade gift set which includes a paper holder box, gift tag ,card and photo frame. 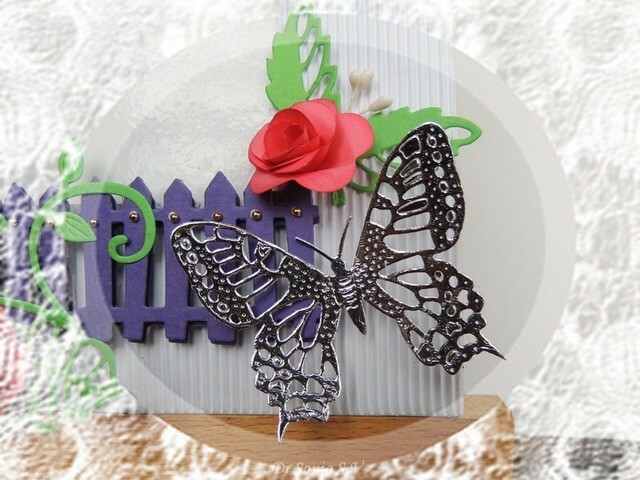 I have a fascination with aperture cards and have had fun hand cutting them in the past. Though making aperture cards is a piece of cake for most card makers with machines...it was not so easy for me as I am new to the world of die cutting machines...and made some silly mistakes.So to help novice Bigshot users like me,sharing this aperture card tutorial ! Score an 8.5 x 6 inch card at 4.25 inches. 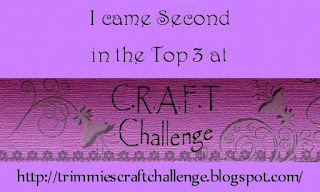 Chose this size as its an ideal size to emboss half using the ItsyBitsy embossing folders I have. 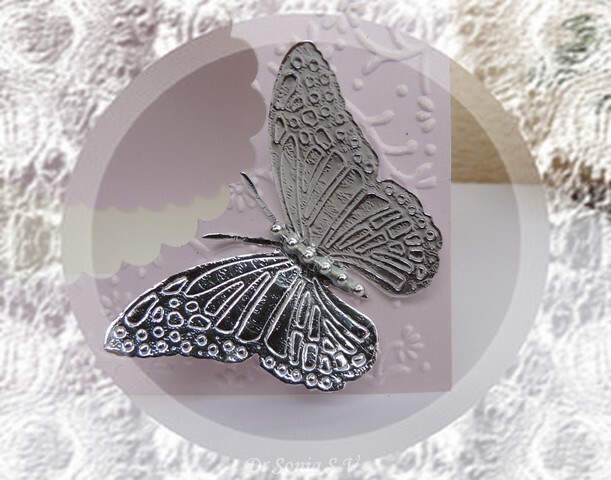 Place your nestie/frame die on the center of one half of the card with the ridged surface touching the good side of the card[If the card /paper has a good side eg with shimmer or glitter ,placing the good side against the cutting ridge side of the die makes it cut better ]. 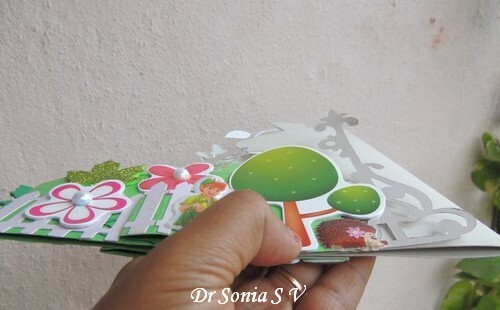 Lightly stick the die to the card using tape which is not too sticky so that when you remove it ,it doesnt tear or mark your card. Sandwich for the bigshot will vary depending on your die.For my Sizzix framelit :Multiplatform-Clear Plate,Die with ridge facing up,Paper with good side facing down,Clear plate.Roll over and you have cut your aperture card . If you are planning to emboss the most important tip is remember to cut first and then emboss as otherwise you will spoil all the lovely embossing! [I made this mistake earlier]Place your aperture cut card inside your embossing folder .If your card has a good /shiny side make sure the rough raised edges of your embossing folder are on the non shiny side so that the final embossed pattern gives raised pattern on the good side of your aperture card. 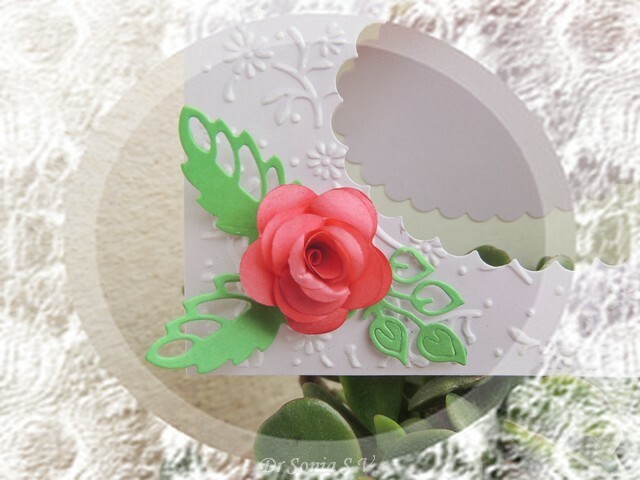 Added a 6 petal flower punchcraft rose and some Marianne die cut leaves on one corner of my aperture card. 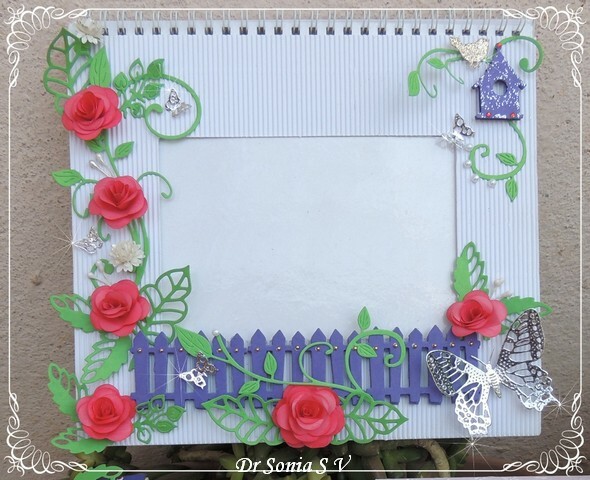 The tiny golden knobs on the fence are "bindis".All the tiny butterflies have been cut from thick silver card using Cheery Lynn dies . 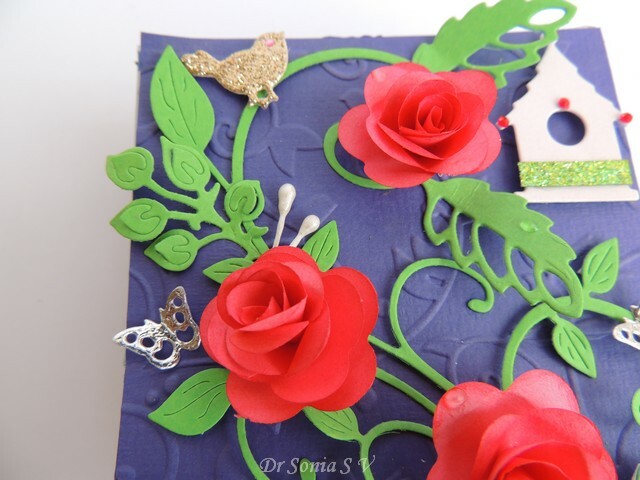 The background paper is a gift from my friend Nupur and has tiny embossed birds to give company to my glittery birdie! 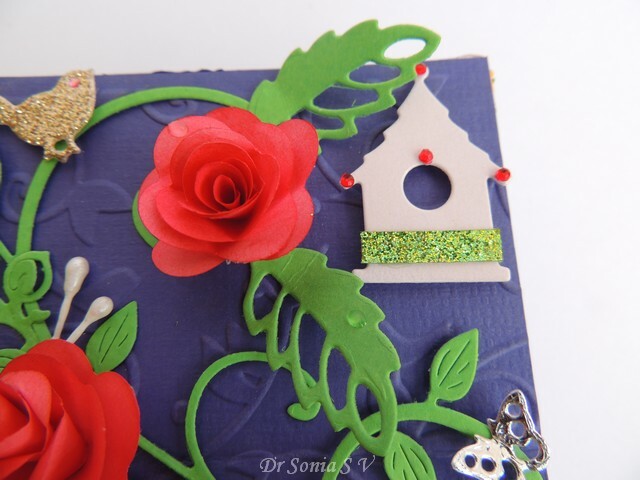 The red gemstones on the bird house are also"bindis"[used by us Indian women as decorative adornments on our foreheads! ].Used glossy accents to make tiny dew drops on the leaf and petal of the punchcraft flower. 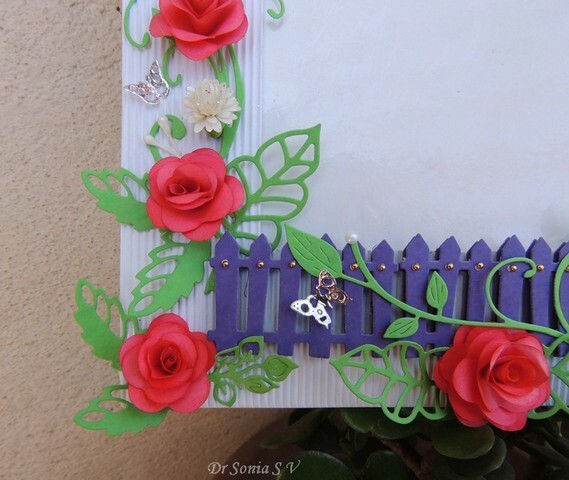 The fence goes all around my altered box. 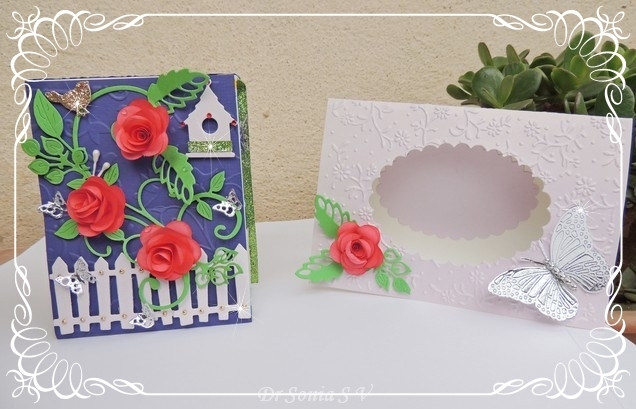 Its the first time I am playing with so many fancy stuff such as dies and embossing in a project..All the dies are new crafting toys bought from Priya and in my excitement to use the new goodies..feeling I have gone overboard...opinions and reassurance needed!! 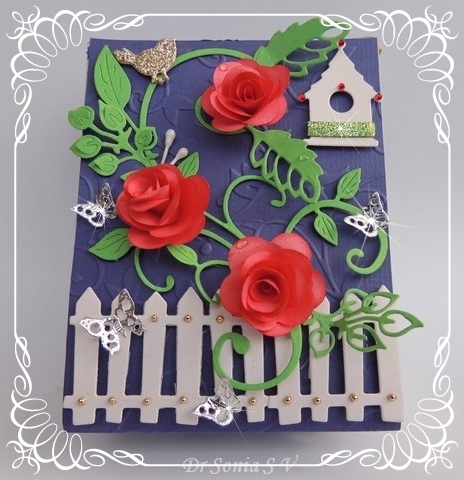 PS: I am facing a lot of difficulty with the new blogger format with my dashboard and blog reading list not showing posts from fellow crafters...so having lot of difficult seeing my friends new projects.Is anyone else having this problem?